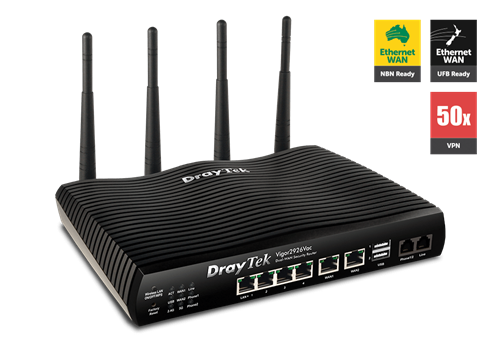 The Vigor2926 Series provides reliable broadband connectivity with the multi-WAN accesses. The two Gigabit Ethernet WAN ports can be operated in failover or load balancing mode to ensure a steady Internet connection. The two USB ports can work with 3G/4G/LTE USB modem to add additional wireless Internet access. They also provide comprehensive networking functions, including VLAN, Bandwidth Management, Quality of Service, DNS Control, SPI Firewall, Web Content Filtering, and Central Management solutions to provide a reliable and secure business network.